Background Interleukin 21 (IL-21) is a potent immunomodulatory cytokine mainly produced by NKT and CD4+ T-cells, particularly the inflammatory Th17 subset and has pleiotropic effects on both innate and adaptive immune responses. These actions include positive effects such as enhancing proliferation of NK cells and cytotoxic T cells, and inhibitory effects on the antigen-presenting function of dendritic cells. It can also be proapoptotic for B cells and NK cells. Recent studies have shown that IL-21 is also an autocrine cytokine that potently induces T(H)17 differentiation and suppresses Foxp3 expression, and serves as a target for treating inflammatory diseases. Buffer phosphate-buffered solution, pH 7.2, containing 0.09 % sodium azide. 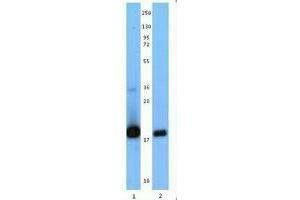 Final antibody concentration is 0.5 mg/mL. Storage Comment Upon receipt, store frozen between 2°C and 8°C.